Pyridomycin is a compound produced by Dactylosporangium fulvum with specific cidal activity against mycobacteria. By selecting pyridomycin-resistant mutants of Mycobacterium tuberculosis, whole-genome sequencing and genetic validation, we identified the NADH-dependent enoyl-(Acyl-Carrier-Protein) reductase InhA as the principal target and demonstrate that pyridomycin inhibits mycolic acid synthesis in M. uberculosis. 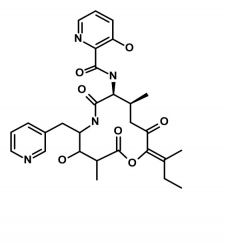 Furthermore, biochemical and structural studies show that pyridomycin inhibits InhA directly as a competitive inhibitor of the NADH-binding site, thereby identifying a new, druggable pocket in InhA. Importantly, the most frequently encountered isoniazid- resistant clinical isolates remain fully susceptible to pyridomycin, thus opening new avenues for drug development.